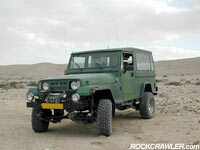 This article comes to us from Israel's JEEPOLOG.com. We thank them for sharing this great article and the accompanying photos. The M240 "Storm" – "Sufa" in Hebrew, has been the hard-core wheelers’ vehicle of choice in Israel since its introduction in 1992. 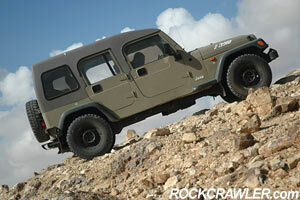 It is a militarized version of the Wrangler YJ, made by AIL (Automotive Industries of Israel) of Nazareth. Yeah, the original one, hometown of Jesus Christ, is also the Jeep capital of the middle east. 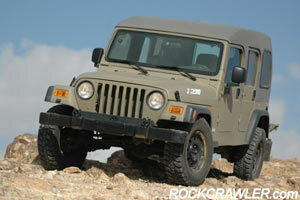 The plant at Nazareth has been churning out several hundred Jeeps annually for the last three decades. An official Jeep assembly plant, it receives CKD kits (Complete Knock Down), assembles and modifies them according to the needs of its customers – the IDF, police, border patrol, park rangers and such. 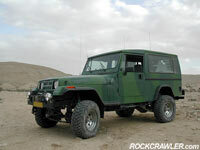 Until 1991 it still turned out heavy duty versions of the CJ-8 – five years after the last new CJ was seen in the US. The Storm brought modern YJ technology and that awesome 4.0L straight six. The 104 inch wheel base Storm came with a soft top or a metal "world Jeep" top and featured a Dana 60 rear axle, NP241 transfer case, 12/24 volt electrics and various other heavy duty modifications. In its last years of production, 1998-2000, it also offered a VM diesel (not very good) and 4.10:1 ratio axles. It did not, however, offer electric windows, power door locks, or even decent carpeting. It was all go, no show. We loved it, except for one big drawback, not enough doors. The average Israeli family can't afford more than one or two cars, and this makes most Jeeps daily drivers by necessity. Daily driving means getting kids into and out of safety seats several times a day, every day. And with no rear doors, this becomes a real nuisance. By 2000, M240 Storm production dwindled to a trickle. The US production lines had long since switched to TJs, and CKD kits were no longer available. However, the armed forces needed Jeeps. Although the TJ was already a few years into production, AIL decided to start the development of a new Jeep- the Storm MK2, based on the TJ-L chassis. But The MK2 came very late. For reasons political and irrelevant, development took years and years and production did not start until 2006 – the last TJ year in the US. As badly as the IDF needed fresh vehicles (they were so desperate they started buying Land Rover Defenders), us weekend Jeepers needed them worse. Good builders were getting rarer and rarer, as the last year that saw substantial production numbers was 1996. In January, 2006 we finally put our hands on the final pre-production prototype and took it for a weekend of wheeling in the Judea desert, courtesy of AIL. Boy, were we excited. We've been eagerly waiting for years, and here it is, Military Tan, waiting in the parking lot for us. It looks familiar, almost the same as the old Storm, but the proportions are different. It seems to stand lower; the longer wheelbase (longer than the perfect 104 inches of the old Storm) makes a very short rear overhang, and a very long belly. The Fiberglas top looks awkward. Money was obviously saved in the "exterior design" department. And then it strikes us. Doors. Five of them. Our dream of many years has come true. The sporty TJ hood looks somewhat out of context with the long, tall body. Above the fenders, we see the words "Storm 2", Yep. It's here. Enough ogling, It's time for wheeling. 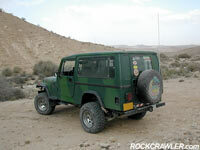 The Judea desert makes a perfect proving ground for Jeeps. The wady's (dry river beds) here are steep and rocky, changing their appearance several times every winter under furious, deadly flash floods that appear and are gone within minutes. They make for excellent trails, ranging from hard to impassable. We are used to turning back. The Achilles heel of the old Storm was always the suspension. Punishing, coarse, heavy duty leaf packs made it known as a bone breaker – in sharp contrast to its major rival in Israel, the British Defender 110, one of which accompanied us. The Storm MK2 with its TJ coil suspension is plush in comparison – a bit too soft for our taste. Bilstein shocks on all four corners help a lot, with the 116" wheelbase making a very stable platform. We climb a steep, rocky, ridge like the backbone of a dinosaur, appropriately named Lizard hill. The 4.10 axles and 6-speed manual give a great 1st LO speed. The day is clear and cold and we have a windy cup of coffee at the top, then drive back down, into the dry wash of the Zeelim wady, strewn with boulders of all sizes. 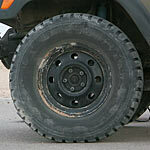 We find that the 32 inch tires (Military Goodyear G171 235/85R16) combined with the stock ride height give poor clearance. The skid plates keep pounding the rocks. The stock suspension (stock TJ pieces with higher spring rates) does not deliver a lot of travel, either. These are minor issues – when we get our hands on surplus Jeeps in a few years, 4-6 inch suspension lifts will complement the long wheelbase very nicely – better than any SWB wrangler. Inside the cabin, everything appears stock TJ. Dual AC promises to keep us cool in the long summer. Unlike the old Storm which was quite a handful to drive, the MK2 instills confidence and is a pleasure to drive off-road. The best part of the old Storm they kept - the fabulous 4.0L engine. We love straight sixes, and this one is the best ever. With a 6 speed manual transmission, HD transfer case with slip-yoke eliminator from the factory, we can hardly ask for anything more. Well, a 4:1 LO and Dana 44 front axle from the Rubicon parts bin would be nice. On the road again, it rides almost like an SUV. It handles, steers and brakes well, much better than the older YJ based Storm, but the extra weight takes it toll. With five large adults inside – seated quite comfortably actually – it is a bit slow on the highway. Overall, The Storm MK2 makes a great 4WD. Five door utility, low gearing, indestructible tires, great power plant and the feel of the universal Jeep – that something that all other makes, including the Land Rover accompanying us, are missing. We don't need any more out in the desert, on the old Spice road or Sultans "highway.” And on the paved road, it's more than adequate. Not perfect, though, this is, so far, the best Jeep we ever drove. 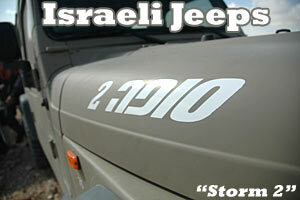 In the last year an undisclosed number of Storm 2 Jeeps entered service and are a common sight on the roads of Israel. While we are waiting for them to come out as surplus, once again, supply of CKD kits for the TJ-L is stopping. But we're not worried - the JK based J8 is coming, with a rear Dana 60 on leaf springs, Rubicon Dana 44 front, and a powerful 2.8L 170 bhp VM diesel, hopefully better than earlier versions. This so called "Storm MK3" looks to be even better - and this time, AIL seems to be synched with Chrysler, so the third generation of Storm Jeeps will have a long, healthy production run. The few hundred Storm MK2s will remain unique forever.